For most small businesses, a website is the single most important part of their marketing strategy. All roads lead to Rome, and all links lead to… The internet. Which is where your website will be. And while some may incorrectly claim otherwise, the content of a website is by far the most important part. Besides being the only thing search engines care about, it’s also the most effective at persuading your potential buyers. Without great content, there is no sale. Period. Content is significantly more important than your website design, though that’s important too. The content should come first, the design after. And before even the content, comes your marketing plan. Of course, you could always just concede that your content is terrible and focus on manipulation to get results. The marketing plan is perhaps the single most-underutilized tool in the small business arena. Without a solid marketing plan and strategy, you’re just blindly grasping at straws, trying any tactic you can think of. So if you haven’t done this yet, you need to do it now. I won’t go into incredible detail here but here are some key steps to developing your first marketing plan. Your brand values and mission statement might guide every decision within your business, but the completed marketing plan will guide every marketing decision. With this document properly in place, your decisions will be much easier and you won’t feel like you’re blindly trying things out. If you have anything prepared, gather that now. If you’ve ever strategized about your marketing before, presumably you have something written down to show for it. Gather it all up and review! The goal her is to get a cohesive picture of what you’ve planned in the past, and hopefully you’ll be able to evaluate what’s working and where you’d like to go with your efforts. It all starts with empathy for your clients. If you want to sell to them, you need to anticipate their needs and their questions. That’s how you sell to them. It doesn’t really matter what you want to share or the channel you want to use. Your entire plan needs to be based around the needs and feeling of your target customer, or it will fail. You need to keep this in mind whether you are deciding which channels to be involved in or what types of things to say. There are lots of great resources on performing this step. You might think that your target market is one thing but if you haven’t actually interviewed your best clients or done any other research, you might be way off base. And if you’re off, odds are you aren’t communicating effectively with them. That’s why it’s so critical to know your target market. Target markets consisting of young athletes, people who attend concerts, and people living in cold climates. Once you’ve figured out your target market, you should starting putting together one or more buyer persona. This is essentially a pretend “character” that is representative of a subset of your market. The more detail here, the better, because it helps you imagine you’re talking to an actual person when preparing content. “Kevin is the 40-year-old owner of a company that builds high-end custom homes. Kevin has a wife and kids and understands the value that quality brings. He builds the best homes and demands the best from products and services he spends money on. And with a buyer persona like that, you can really start writing awesome content. Personas of a young athlete, someone who goes to concerts, and someone living in cold climates. Before you can write the meat of the content, you’re going to need to develop the skeleton of the website. Planning is your friend. It will make sure your content is consistent with your overall marketing strategy and it will also make sure you don’t forget anything. The following is a list of things you should keep in mind during this phase. 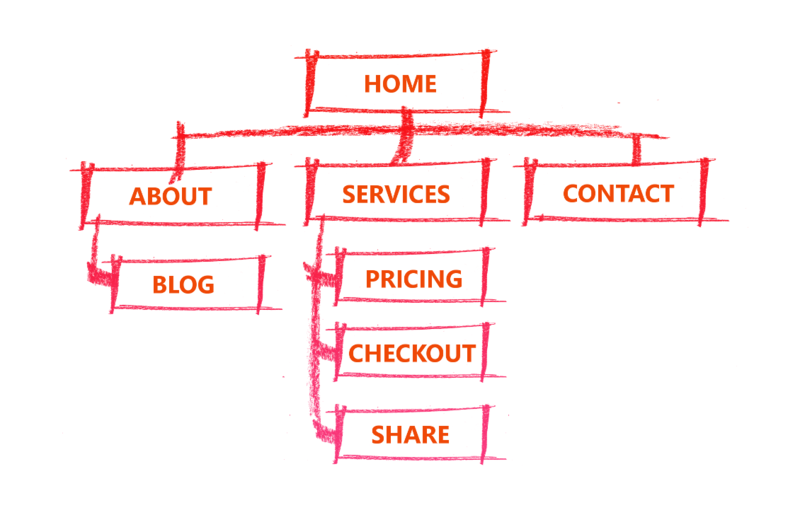 You don’t need a whole lot of structure yet, just literally start listing things. You probably already have a good idea of the important pieces to include about yourself; now it’s time to put them on paper. Remember to keep your ideal customers in mind while coming up with this. They might not care about the minutia of your business structure, but they will certainly care to learn more about the services you offer. Give the people what they want! Using crayons for this is totally optional. Again, be thinking about both your marketing strategy and buyer personas. It’s not enough to just come up with a list of pages, write the content, and call it a day. You need to design your content with intention. There is a ton that could be said about this topic and UX/UI and sales people could go on for days. But suffice it to say that you need to lead people towards something. Which leads us to the next point. What’s the intended goal? What are your calls-to-action? Your marketing strategy should really be guiding this one. Depending on your industry and business, common calls-to-action could be things like signing up to your newsletter, to download an e-book (and getting added to your email list in the process), or to pick up the phone and dial your number. There’s no right answer here but you should probably have some idea of what you want your visitors to do. Now it’s time to guide them to do it. In the first iteration of the website, this part doesn’t have to be absolutely perfect. Testing will help us fine-tune our calls-to-action and figure out how to maximize our conversion rates. How can you get your visitors to that goal? You’ve established the goal, now you have to figure out how to get people to it. Generally you’re going to want to slowly dismantle barriers using your content. Convince them that you can solve their problems, and they will be more open to moving on to that next step. At this point you’re combining everything you’ve produced up to this point. You’ve decided on what content you need to include, your calls-to-action, and even strategized about how to get visitors from one to the other. Now it’s time to combine all of that content into a list of pages that will get people to the finish line. Maybe they start at the home page, go through some important information, and then end up giving you their email address. Great! Make it happen. Don’t leave any holes; make sure anyone visiting your site is guided through your site logically until they reach the goal. Your main navigation should generally be fairly sparse. You don’t need a thousand pages to convince them to buy your product or service. You just need the right pages with the right content. You need to give them the exact content they are looking for to show them how you can solve their problems. You don’t want to confuse them with unnecessary content. Keep it simple! That being said, generally having more quality content is better, but not in your main pages. You’ll want to supplement your main site with blog posts and landing pages in the future. These generally will not find slots in your main navigation, however. Now is the time to actually bust out the old Pilot G2 and start writing. Okay, I wouldn’t actually recommend using a pen, a keyboard would probably be better. But do what feels write. Get it? ‘Write’? The following are all things you’ll want to keep in mind while preparing your content. Audience is what you learn in writing 101, and in your case, you should already know who your audience is because you came up with your buyer personas in step 1. If your audience was your grandmother, you’d write very differently than if your audience was the president of The United States. Keep that in mind. Talk to your audience like they are actually people and your writing will be much more effective. Nobody can conjure up great writing instantly, but by simply learning some fundamentals and focusing on what’s important, you can drastically improve your writing quickly. This book is an excellent resource for simply learning the fundamentals of writing. Everything from knowing your audience to grammar and punctuation are addressed. This book really dives into the marketing behind your website content. It goes a step further and recommends incorporating content marketing into your broader strategy. Really try to imagine what your buyer persona is going through. Anticipate their needs. If you think they might have a question, answer it. Don’t drone on about how great of a company you are, because nobody wants to read that. Truly having empathy for your buyer persona is key to engaging them. And they want you to cater to their needs. You might want to focus on how your restaurant allows dogs while your customers are actually looking for interesting food choices and locally sourced food. Nobody cares about your company history, accomplishments, or other uninteresting information. Odds are they don’t care at all about you – yet. You need to make them care about you. How do you do that? By understanding their pain points and then solving them. Do you see the difference? You need to understand the problems your visitors have and provide solutions. Most content for a website should be as conversational as possible. It makes it more engaging for your readers because instead of feeling like they’re being talked at, they feel involved. It all goes back to empathy! To that end, if your content is so stale that you’re saying things like, “Boring Industries, inc, strives to succeed at solution. They believe in a better world!” You’re going to have a bad time. Nobody wants to read that garbage. Using a “we” focus is better. At least then you’re speaking for yourselves. People like when you’re being honest in your representation. But you’re still talking about yourself and not engaging your visitors. It’s best to use a “you” focus. Speak directly to your visitors. Identify their pain points. Show them you get them. There are better ways to demonstrate your credibility and build trust than talking endless about yourself. Usability experts would say that because people are constantly bombarded with content and information, they don’t have time to read through long blocks of text. I say people are lazy. Doesn’t matter who’s right, you still need to adapt! I recommend trying to keep your paragraphs to 1-4 sentences. Anything beyond that, and people just aren’t going to have the patience to read through what you’re writing. It’s also simply easier to get the information you need when it’s not buried in the middle of a long paragraph. This is something you probably should have explicitly outlined in your marketing strategy session in step 1, but you can still do it now. Identify the tone of your brand’s writing and stick with that. I go into more detail of this in our post about creating high-traffic blog posts. Once you’ve got that covered, you can send a consistent, powerful message to your potential clients across all of your communications. We touched on this a little bit earlier, but it’s key to keep things conversational. Interacting with your visitors means that you need to interact with your visitors. Go figure. Have a conversation with them. Anticipate their thoughts and feelings and cater to them. That’s how you draw them in. People get bored easily. Make things easy for them by including various types of media or presentation. Remember when you had that one teacher in high school who would included short videos throughout his lessons? I’ll bet it was the most engaged you’ve ever been. You need to break that content up! If your business creates things that are fun to look at, show it off frequently. If you have anything in list, put some numbers on that list! If you have videos, embed them. Nobody wants to read a novel on the internet, least of all your visitors. Unless you’re a novelist, of course. But are you a novelist? No. The revision phase is one of the most important and often ignored steps of creating the best content. Don’t be the person who ignores it! The key is to understand that it’s more than just fixing minor typos and grammatical errors. So much more. Here are some steps and things to keep in mind to make sure you are revising properly. Your first read through, it’s likely you’ll find many obvious issues. The low-hanging fruit if you will. This is where you’ll be encountering poorly-worded sentences and actual typos. Fix them on your first pass. Not a lot of people do this, but more people should! Your best clients are literally your target market. Wouldn’t it make sense to have them be the ones to read it and give you feedback? Look in particular for any parts which confuse them, or if they are left with unanswered questions. These are the areas you area really going to need to work on. Two versions of a website battling it out through a/b testing. You may even get some entirely new insights! Take any suggestions from them very seriously. This may be something for down the road, but if you have the resources available to you to do some split testing right away, do it! There’s no better way to create the very best content. This is particularly useful for important pages like your home page, and also for your calls-to-action. These need to be as effective as possible, and testing minor differences in wording and placement can yield extremely valuable information. Our visitor flow view for Google Analytics. Our site gets mostly landing page traffic, so this page isn’t quite as useful for us. This is very rarely the case for most websites. Great website content is an iterative process, and you’ll want to use the flood of data Google Analytics gives you to make improvements. Once your site has been online for a while, you should go into your Google Analytics and review the visitor flow. You can use this information to revise your content. For example, if you find that visitors keep leaving once arriving at a specific page, you’ll want to take a look at that page and determine whether that page can be improved. 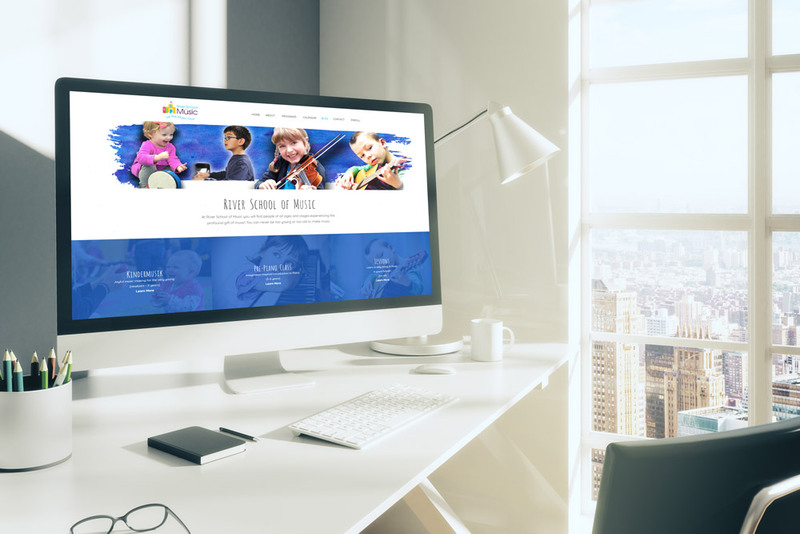 A note here: certain types of pages, like landing pages, generally are designed to either get direct search engine traffic or to serve as the destination for visitors from a specific marketing campaign. They don’t generally fit in to the “flow” of your website as a whole. The goal for these pages is conversion directly on the page, not to get them to another page. They may be displaying a high drop-off rate, but that doesn’t necessarily mean they aren’t working. Data brings light to the darkness of marketing ambiguity. Armed with your Google Analytics data, you’ll be able to see clearly things which you couldn’t possibly have known when you were first starting on your website content journey. Oftentimes, the pages you thought would be popular aren’t getting any visits, and you may be surprised to find droves of traffic at pages or blog posts that were mere afterthoughts. It’s okay! Use this information. I recommend checking in on your Google Analytics data every week or two just to see how things are going. Look for patterns and changes that can help you improve your site. If there’s one thing I’d like you to take away from this article, it’s this: you have to provide real value – even in your main pages – in order to get new clients. Your site is not a newspaper ad and it shouldn’t read like one. Once you’ve provided value and helped people out, they will want to work with you. This concept seems obvious – and it is. But so few people are actually doing it. Simply by providing your visitors with helpful content, you are getting your foot in the door. They’ll become more trusting of you, more receptive to new ideas, and more willing to work with you. I also recommend tying in all of your marketing channels. If you have an email newsletter, brochures, or whatever else it might be, try to connect them as much as possible. Most email newsletters can be embedded on your website, you can blog about your new brochure, business cards, whatever! Likewise, make sure you include your web address on all of your print materials, and clearly anything that’s already on the web should be linked to your content. Those steps should be used by everyone. The most powerful content is interesting to users!